A pair of DX0X0 cylinder magnets separated by a small gap. Small plastic spacers are squeezed in the middle for this example, preventing the magnets from touching. Output from the Gap Calculator. Magnetic field strength between two DX0X0 cylinder magnets. This depicts the same results as the graph from the calculator above. This article describes our latest Magnet Calculator -- the Gap Calculator. When a very strong, uniform magnetic field is required, a pair of neodymium magnets can help. A single magnet in free space has a strong magnetic field around it. However, the farther away from the surface of the magnet that you measure it, the weaker it gets. How strong can such a field be? For some of our strongest magnets, the field right at the surface can reach 6,000 or 7,000 gauss. As you move away from the surface of the magnet, however, the field strength can quickly drop. For example, consider a ½” diameter x 1” tall cylinder like our D8X0. 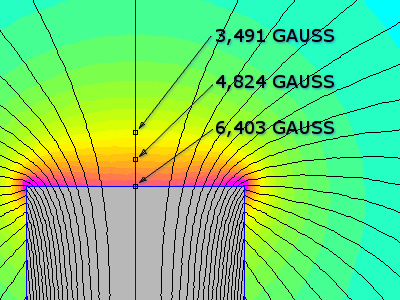 While the field strength right at the surface is 6400 gauss, it drops to 4,824 gauss at just 1/16” (1.6mm) away! This isn’t great if you want a field that’s fairly uniform in a given volume of space. Take two disc/cylinder magnets held so that opposite poles face one another with a small gap between the magnets. The magnets are attracting, not repelling. You will find a strong, fairly uniform magnetic field between the two magnets. 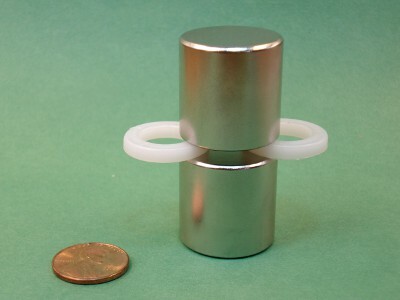 Consider two 1” diameter x 1” tall DX0X0 cylinder magnets. Set them near one another with a small, 0.1” gap between them. You will find a very strong magnetic field between the two magnets, which can exceed 10,000 gauss at the center. This field strength is stronger than you could achieve with a single magnet. With our new Gap Calculator, you can try different combinations yourself, varying the magnet’s diameter, thickness, grade, and the gap between them. The calculator shows the field strength at a point in the middle, between the two magnets. It also graphs the field strength (for the portion of the magnetic field that is in the vertical direction) across the diameter of the magnet. It’s possible to achieve field strengths up to 10,000 – 12,000 gauss (1.0 - 1.2 Tesla) with small gaps, especially if using magnets that aren’t too thin. If you’ve seen lab equipment that produces a strong magnetic field with older kinds of magnets, you’ve probably seen the magnets mounted on an iron yoke. The yoke directs the magnetic field through the iron, rather than through the air. This does two things. First, it helps to prevent weaker magnets from demagnetizing themselves over time. Second, it increases the strength of the field in the gap between the magnets by providing an easier return path around the magnets. While such a yoke isn’t always necessary when using neodymium magnets, it can help to achieve slightly higher field strengths. It may also allow you to achieve high field strengths with thinner, less expensive magnets. Consider the pair of DX0X0 magnets with a 0.1” gap mentioned in Configuration #1 above. They yielded a field strength of 10,498 gauss at the center without a yoke. With a steel or iron yoke, they should provide a field strength of nearly 11,800 gauss between them, over 10% stronger. For an example where an iron or steel yoke might make a greater difference between the yoke and no-yoke configurations, consider a thinner, 1” diameter x ½” thick DX08 magnet. With just the two magnets at a 0.1” distance, the field strength between them would be about 8,300 gauss for the yoke-less configuration. With a perfect iron yoke around the magnets, it might be over 11,500 gauss. That’s a big difference. The calculator assumes an ideal, perfect yoke. It assumes that the magnets are touching it directly, and that the yoke is big and thick enough so that it is not saturated anywhere along it. Real world measurements may vary, depending on your yoke. It’s possible to achieve field strengths up to 10,000 – 13,000 gauss (1.0 - 1.3 Tesla) with small gaps, slightly higher than with two magnets alone. For folks looking to make magnetic fields that are much stronger, we’re often asked about fabricating magnets that come to a point. While this can be done in some cases, it only produces a small region with a strong magnetic field. Instead, consider the use of steel/iron cone sections to amplify the magnetic field strength in a region. In this case, we use sections of a cone shape made from steel or iron. Since these materials are much easier to fabricate into complex cone shapes than neodymium magnets, the use of steel cones can be more economical and precise. The cone can direct more magnetic flux through a smaller area. Let’s consider the previous examples where we were interested in creating a region with a strong magnetic field that’s 1” in diameter and 0.1” thick between a pair of magnets magnets. Here, we can use bigger magnets, but choose a cone size that angles down to the 1” dimension at the gap. If we use 2” diameter x 1” thick DY0X0 magnets, a steel/iron yoke and two steel/iron cone sections with a 2” large diameter and a 1” small diameter, the field strength between them can top 20,000 gauss! The calculator assumes a 45 degree angle in all cone sections. 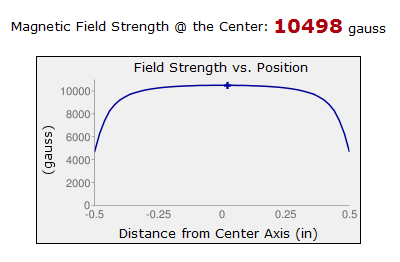 This is typically close to the optimum angle for the most field strength. It is possible to achieve field strengths of over 30,000 gauss (3.0+ Tesla) with this configuration. Why would I ever need a magnetic field this strong? Strong magnetic fields like this are often used in research. Indeed, many of the emails we receive on the subject are from graduate students, PhDs, and other folks in working in research and development. Powerful magnetic fields are useful for a variety of reasons. For example, read about the Faraday effect to learn about how a strong magnetic field can affect the polarization of light. Also read about the Zeeman effect, where the presence of a static magnetic field can alter the spectral emissions of some elements. This will quickly lead to things like how an MRI machine works. A growing amount of research uses magnetic nanoparticles for a variety of purposes. For everything from experimental cancer treatments to waste water treatment, these tiny magnetic particles are proving very useful. If you can get the interesting stuff you're studying to stick to the particles, you can then manipulate them with a magnet. 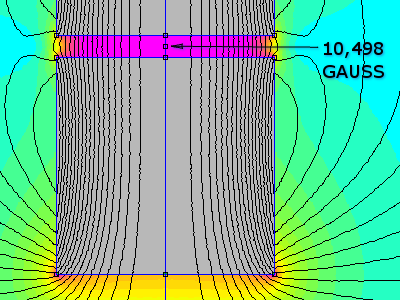 Our magnetic gap calculator derives its answers from a series of finite element analysis studies we conducted for these three specific configurations. We’ve double-checked the results by measuring a number of specific sizes and shapes, making sure the calculator’s answers are close to what we measured. The calculator makes a number of assumptions that might differ from your setup. It assumes the yoke is 100% perfect, which might not reflect the reality of your yoke. When in doubt, make it thick. It also assumes pure iron is used, but even we tend to build such things from 1006 steel. The performance is very similar to iron, but not exactly the same. If this tool gets you within 10% to 15% of your goal, we’d consider it an outright victory. Measuring magnetic fields can be a tricky process. It’s easy to see a magnetometer jump around by hundreds of Gauss in setups like these, just from small wiggles of the measurement probe. The calculator is a good estimating tool that provides a good idea of what is possible. Please use it as a tool in your process, not a guarantee of performance.